Iraq's parliament voted 18OCT 14 to put a member of Badr Organization in charge of the Ministry of Interior (MOI). MOI is charged with overseeing policing and border control in Iraq, comprising several agencies that include the Iraqi Police, Highway Patrol, Traffic Department, Emergency Response Unit (ERU), Explosive Ordnance Disposal Unit, and Department of Border Enforcement. Additionally, Badr Organization Military Wing engages in combat operations against ISIL in Iraq. HM-20 as seen at an Iranian military parade in 2010. HM-20 features four banks of ten rocket tubes in two sections, hydraulic traversing and elevating system with electronic firing controls. 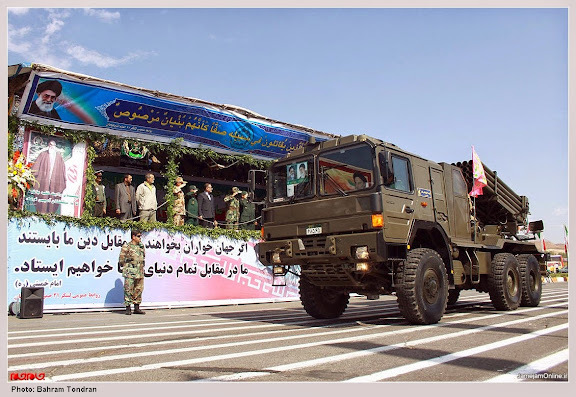 Note same adapted MAN 6x6 vehicle used as platform for this MLRS and one now claimed in use with Badr.